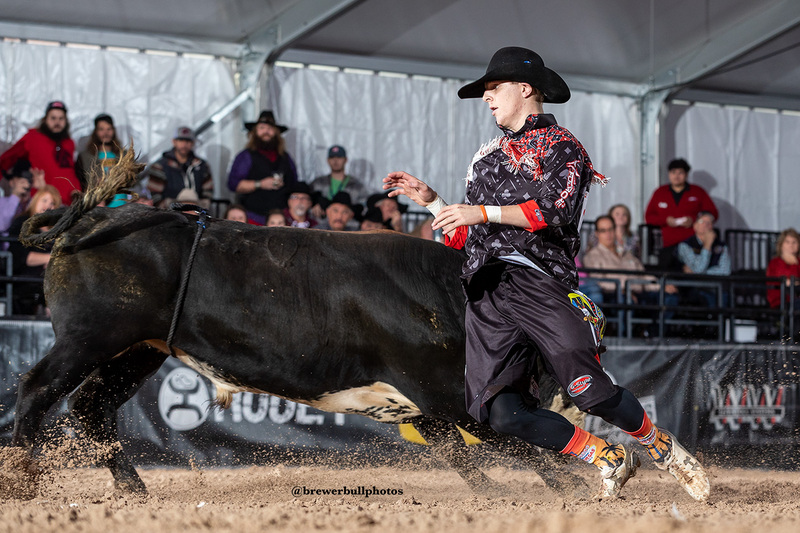 LAS VEGAS – One bull wasn’t enough for Chance Moorman on Tuesday afternoon during the second day of the Flexfit Preliminary Round of the Bullfighters Only Las Vegas Championship. Late in his initial bullfight, Moorman was awarded a refight. Since he was the last of the nine men to fight, he only had about five minutes to prepare for his second bout. That was all the time he needed, though, producing 84.5-points against Rockin’ B & Magnifica’s Papa Smurf to win his flight and have the advantage heading into his second preliminary round on Thursday afternoon. “After my first bull, my ribs were really hurting,” Moorman said, pointing out that he suffered the injury last week during the Qualifier Rounds. “That first bull hit me pretty good, and that’s what was holding me up on making the decision to take the option for the refight. Once I heard the score, I knew that wasn’t going to do. I knew right then I had to take it. It worked out, and the Lytle, Texas, bullfighter controlled his foe through the entire 60-second battle. He posted the second highest score, just behind Cade Gibson of Pilot Point, Texas, who matched moves with his bull for 86.5 points. He has just a half-point lead over Roughy Cup champion Beau Schueth. “We’ve been looking at that round since the list came out,” Gibson said. “All the bullfighters decided that was going to be one of the toughest prelims going, because Beau is a stud, and Justin (Ward) is great and content to step in and do some big things. The Las Vegas Championship format requires all of the athletes to face two bulls. The top two-fight cumulative scores in all six flights will advance to the Hooey Championship Round on Saturday. The remaining combatants will battle for the final six spots in Friday’s W-W Wild Card Round. Both Gibson and Moorman knew they had to step it up. Gibson’s lead is much closer, and Schueth is an experienced veteran who can close the gap quickly. “I was bummed at myself that I didn’t get to close the fight with a sell,” Gibson said. “Beau hit that spine grind on his sell, and that’s his signature. Getting a sell would have given me a little bit of a cushion going into Saturday.